When you consider shoes for the workplace and daily work wear, heavy duty and durability of the shoes are the prime factors that are considered in general, like the steel-toed boots. These shoes are capable of protecting you from falling or tumbling or sliding and even from getting hurt if something heavy falls on your feet. There is various another kind of boots other than the steel-toed ones; these shoes also provide you arch support, traction, support and other safety measures. Work boots are very important for industrial and construction workers. Also for cold weathers, extreme cold weather boots are available, and these shoes are assessed to avert workplace hazards and also provide great foot protection. Let us now look into the benefits of lightweight work boots. The winter work boots for men have a good insulation system which keeps the feet warm enough to battle the tough cold work days. Even with the insulators, these boots are not bulky in nature, but quite lightweight. The outsoles of the winter work boots have excellent traction. These boots have trodden in the sole that that fitted with a strong insole, creates a great traction and also friction which helps you to keep moving in the snow and also prevents slipping and falling down on the snow. Regular work boots cannot stand the harsh cold weather, the snow and the damages of ice; the saltiness in the ice erodes the material of the regular boots and makes them ugly. For the harsh winter weather, winter work boots are the perfect fit as they can withstand the harsh weather and keep you warm as well. They are much less prone to the wear and tear and will last more than few years. The work boots must have an insulated sole. The level of insulation varies on the basis of nature of your exposure to the cold weather. If exposed to normal temperatures in winter, go for 200gr insulation material. For a little more harsh temperature choose 400gr to 600gr. For extreme cold temperatures, choose 800gr to 1000gr. You need boots that are unable to transfer the temperature from its composition. Composite boots are the choice for this requirement. These boots are made of non-metallic materials which restrict the transferring cold inside the shoes, to your feet. To prevent the transition of cold to your feet, you should always consider choosing winter boots with either nylon or fiberglass shanks. Metallic shanks transfer the cold, but as nylon of fiberglass is poor conductors, they keep your feet warm and cozy. Also, these materials are poor conductors of electricity so no chance of electrocution. Getting your feet wet in low temperatures isn’t what we want, so waterproof winter work boots will keep you warm and dry and prevent you from getting sick due to wet feet. 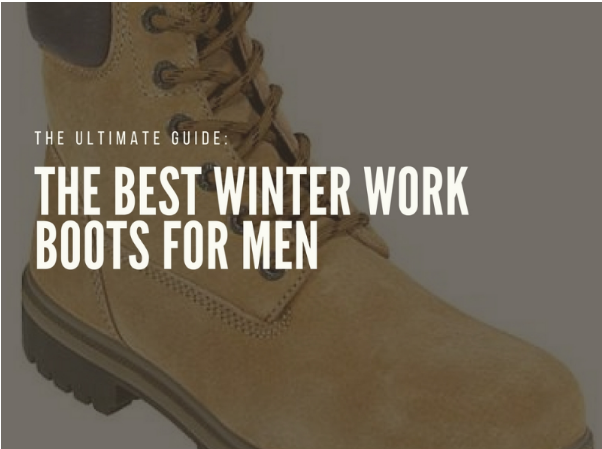 So here are all the more reasons to wear a winter work boot to your workplace. Guys these shoes are really comfy and a great investment, so for your own safety and comfort, you must have at least one pair of winter work boots with you.